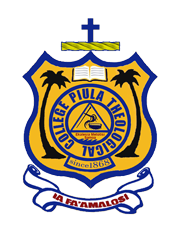 ii) to facilitate their capacity for further studies and specialisation in their field of interest or prescribed by the Conference for Piula Theological College staff development programmes. i) Demonstrate an ability tp engagein the detailed study and principled interpretation of the primary texts of the Christian faith using a variety of methodologies, and critically interact with a range of historical and contemporary reflections on those texts, appreciating the different traditions and contexts in which these reflections are situated. ii) Demonstrate an understanding of theology as a coherent academic discipline, including familiarity with its concepts, history and principle sub-disciplines, acknowledging the diversity of viewpoints that characterise scholarship in the discipline as a whole and in relation to other world views. iii) Show evidence ofthe development of the creative, critical and reflective thinking and basic research skills that will support a life of continued theological learning. iv) Critically engage their context – personal, church and in diverse community settings – in the light of their understanding of theology, and be able to communicate theological ideas, principles, and knowledge to specialist and non-specialist audiences using a variety of means that will have particular regard for the realities of Samoan and Pacific experiences. v) Articulate the implications of Christian belief in their spiritual and moral living. Advanced level of leadership in both community and worship services of the Methodist Church in Samoa. i) A Diploma in Theology from Piula or any other Theological institution recognised by Piula, and is a member of SPATS, or any other recognised accreditation agency. ii) The Conference of the Methodist Church in Samoa (stakeholder) reserves the right to nominate candidates for Bachelor of Divinity studies in Piula. iii) The principal and staff reserves the right toadvice the Piula Executive Committee or the Conference on such matters regarding entrance into the BD Programme of foreign candidates who do not wish to become ministers of the Methodist Church, but are interested in the Piula BD programme. To graduate with a Bachelor of Divinity, candidates must complete 46 courses with a minimum of 50% pass mark. In addition to the required courses, BD students are mandatory to provide a research paper of no less than 65 doubled spaced typed pages on a topic of relevance to advanced and critical research. An award of Bachelor of Divinity with honours will be awarded to an outstanding candidate as suggested by the Assessment Policies and endorsed by the staff under the recommendation of the Academic Dean and Principal.